New technology has the tendency to replace older technology. This is the way the world works. Sticks and stones are replaced by bows and arrows. Bows and arrows are then replaced by guns and heat seeking missiles. However, as technology progresses there are always a select few who hold onto their current technology because they know it is just as good as the new stuff, if not better. Such is the case today, with music. Recently there has been a resurgence of listening to records and Randy’s Records is one record store that has been through the high time of record sales to the low, and back again. Though Salt Lake is a smaller city and may not have the sheer quantity of music stores that other cities have, it still has some incredible music and record stores. Graywhale music has a plenitude of records, C.D.’s and other entertainment and has six locations in the greater metro area of Salt Lake, one right next to the U on 1300 East. Raunch Records is an incredible store and the place to hit if you like skateboarding and punk music. They’re located on 2100 south and 1100 East and hold local punk shows every now and then. But Randy’s Records is the foundation of record stores in Salt Lake. We talked with Chris Copelin, a clerk at Randy’s Records, about the store and how she’s seen record sales fluctuate. How long has Randy’s Records been around? Randy’s Records has been open since 1978. We are the oldest record store in Utah. Randy started the store himself in 1978, and he still works in the shop every day: buying used records from folks, and EVERY DAY he puts out about 100 records that are new to the shop!! What made Randy want to start the record store? Randy wanted to open the record store because he loves music. In 1978, he had already been collecting records for about 20 years, so he had a lot of records to sell! At one point, he had over 30,000 45RPM records in his personal collection! Since he had so much knowledge about collecting records and loved music, it made sense for him to open a record store. How have you seen records change over the last few years? Record sales have definitely changed over the last few years. Many vinyl stores went out of business completely in the 1990s when CDs began to take over the market – because so few people were buying vinyl and very few artists were releasing their music on vinyl as a format. As for the stores that entirely switched over to CDs in the 90s – most of them went out of business when CDs became a dead medium due to downloading. Randy has managed to stay in business all these years because of his belief that analog records are the superior format. He was in a lot of debt in the 90s, but still stuck with records because he really believed that people would come back to them. This dedication of his has paid off – he was definitely right that people would come back to records! The shop is busier now than it has ever been. I think that people are into vinyl again for many reasons. I think there are a lot of people who appreciate the huge difference in sound that analog offers – it has a bigger dynamic range, and an overall warmer sound. It is more REAL! But I think there are just as many people getting into vinyl now because they are tired of disposable things like MP3 downloads. When you buy a record, you bring it home, admire the artwork, put the record on the turntable, flip it over for side two, maybe read the lyric sheet. It’s a more engaging experience than scrolling through songs on an Ipod. Also, you can re-sell a record, and you can’t do that with MP3s! And going to a record store is FUN!!! In some ways, it’s like a thrift store – you never know what you are going to find. You can learn about new music from interesting people who may have different tastes and perspectives than you have. It’s a good experience!! I’m learning lots of things with this whole getting married ordeal. My forthcoming nuptials are less than three months away and so far I’ve learned the difference between a maid of honor and a matron of honor, I’ve learned what the color blush looks like, and that it does not go with a brown suit. I’ve also discovered that a good pots and pans set costs more than a months worth of rent and that those plates are not worth buying because they chip easily. My fiancé has taught me that the color of a kitchen aid is of such vast importance the universe itself pales in comparison, for it will forever determine the colors and items with which we stock in our kitchen for years to come! I’ve learned that a duvet is not a blanket, but a blanket cover. I’ve also been learning about thread counts in sheets and why you want your bathroom towels to match your curtain shower. I’ve also learned that my scanning of random items in Target and Bed, Bath, and Beyond is not nearly as funny to my fiancé as it is to me. Who wouldn’t want cocoa butter lotion and a copy of Cada Dia Es Viernes by that heretic from Houston? Apparently I am not allowed to register for the third season of Curb Your Enthusiasm, the Mos Def album, or the postmodern looking lamp. I am told repeatedly that people will buy the things I scan. I’ve also learned the exorbitant price tag Weddings carry with them. Shoot man, we’re having our wedding in a backyard and it still going to cost some pretty hefty g’s. Today I went suit shopping at the City Creek Center. I didn’t want to go there, but it was the only place. After two hours of looking in stores a piece of my soul fell off in the Macy’s dressing room. Everyone in Nordstrom’s, Macy’s, H and M, and wherever else I went but have since tried to block out of my memory, knew I didn’t belong there. One lady in Nordstrom’s asked me if I was lost. Another gentlemen politely asked me what I was doing here and if I needed help. After throwing up over a set of pants in Nordstrom’s once I saw how much they cost, I went to Macy’s. There was a very nice older man with glasses named Craig who decided he would take pity on my poor, dirty, anarchist soul and teach me how to dress. I learned so much! I learned what my size was in a suit jacket and that they measure it by your chest (mine was pretty big, needless to say), he also explained to me that fancy shirts are measured by your neck size and do not come in small, medium, and large. He told me the right height at which your slacks should rest above your shoes and how much of your shirtsleeve should be sticking out of your jacket. At one point I was trying on a pair of dress shoes and he gave me a shoehorn. I didn’t know what it was, but it was red and long and looked like some sort of stick the Aztecs would have used to play some ancient form of baseball with. At first I just stood there, holding it like a scepter, or a very long and skinny, plastic baby. I stared up at him. I asked him If I should blow into it like we did with the rams horn at church, but he explained to me that it was not the sort of horn that made noise, nor was it ever at one time attached to the head of a shoe like a rhino’s horn. Shoes do not technically even have heads. “I really don’t know what to do with this,” I said. He showed me how you use it to help your heel slid easily into your dress shoe. “Of course!” I said. “I knew what it did, it’s just been awhile. I was testing you. I’ve been living in a teepee in Wyoming you see, I was never raised by humans, my mom was a wolf who raised me in a cave next to the Yukon River. In the dressing room I took off my shirt and in the mirror my potbelly stuck out like a hairy pregnant woman’s photo shoot. The bright lights made my skin feel pale, translucent. I took off the rest of my clothes and set them down. All my clothes looked like dirty dishtowels compared to the fancy clothes I began to try on. My hair was disheveled and my beard was fraying into several different directions. After I tried the suit on, I realized that no amount of money spent on a suit was going to make my lumpy hair and pubic beard any more attractive. If anything, put a suit on me and I look more homeless than I did with tattered jeans and hand-me-down t-shirts. Eventually I found a suit and Craig did his best to lie and tell me I looked good in it. He told me how much it was going to cost and I had to smoke several cigarettes right there in Macy’s before I could take my debit card out. Truthfully, I got a good deal and my suit was still on the way cheaper end, but I don’t like spending more than a hundred dollars in a store unless I can sleep in it too. My balls were chaffing because it was hot and I was wearing cheap underwear. I looked at the David Beckham underwear collection and thought maybe I’d give it a shot. I asked a lady how many came in the box for fifteen dollars. “How many? She asked inquisitively. There’s only one per box. I’ve been learning a lot about bed bugs recently. It’s not by choice, rather, it was forced upon me to educate myself once my fiancé Cat and I found bed bugs in our new apartment. For a week Cat had been developing bites along her arm. “It’s probably just mosquitoes, or bugs from camping last weekend.” I told her, thinking she was being overly emotional about bumps along her arm. You know how women are. It turns out they were bed bugs. When I found the first one, crawling on the white bed sheets, reddish and brown and fat from my fiancés forearm, I put it in a Tupperware bowl and told her later that night that we did in fact have bed bugs. I had found two this afternoon. She looked like she might collapse. She looked like how I looked two hours before when I found the bed bugs. I cleaned our whole apartment after finding the two bed bugs and paced the living room with a beer trying to decide what to do. Then I smoked a cigarette and collapsed exhausted on our couch thinking that I was done with this thing called life. Cat was supposed to take a relaxing month off of work to plan our wedding and grieve over her mom’s recent death. She was going to settle into our cute new apartment in the Marmalade district and start nesting, or whatever women do, to feel good about starting a home. Three weeks later though, she’s a homeless couch surfer and I am a bed bug-apartment-exterminator ambassador trying to negotiate how to get bed bugs out of the apartment and whose fault it is and so on. Hence, why I’ve been learning a lot about bed bugs. Did you know, bed bugs feed once a week on human flesh but can live up to seven months without feeding on anything? Also, they can live in electrical sockets, baseboards, and yes, of course your mattress and box spring. And perhaps weirdest of all, they’re attracted to your breath. They follow your breath, like some weird stalker. It’s very creepy really. Bed bugs leave eggs in your clothes and bite in patterns. They only come out at night and it’s nearly impossible to see them in the day. You can see the traces of what they’ve left behind. It looks like crumbs on your bed sheets, tiny black dots no bigger than the point of a pen splattered along your windowpanes and baseboards. Bed bugs have been around for many years but have recently grown due to increased travel, resistance to insecticides, and stricter EPA standards. Damn you EPA! I’ve learned that until the 90’s bed bugs were virtually non-existent because of a certain chemical they sprayed buildings with. That chemical however, turned out to be highly toxic and would cause birds to drop out of the air dead or something, it was probably DDT. Since that chemical was outlawed, bed bugs have returned and given truth to the once meaningless phrase, “Sleep tight, don’t let the bed bugs bite.” Because now, they roam rampant over cities and apartment complexes undeterred by how clean your apartment is or whether or not this is an especially busy time of your life and you have no time to deal with fumigating your apartment before you get married. Last night Cat and I spent our time drying her clothes (because heat kills possible bed bugs) and watching Batman. We’ll probably have to do the same tonight. And tomorrow. Tomorrow someone is supposed to come by and spray our apartment. And maybe after that she can live in peace again. But it might be better to move, if we could get out of our lease that is, which I don’t think is possible. Even after having bed bugs, it’s hard to get out of a lease. You never realize how much of a death certificate you are signing when you sign a lease. After we got the bed bugs I looked up our written agreement on Pest Infestations. It says that we are responsible for bringing any pests into the apartment. The owner is not liable and the responsibility to pay lies with the tenant. Bed bugs don’t care about your plans. They roll in and leave you dealing with the consequences. Like life they stand indifferent, annoying, and impossible to get rid of. What do you have against Rav-4’s? I happen to own a Rav-4. Why did you buy your whole family whips? I promise other posts will not be as long. The first time I met Kyle Costello, we picked up dog poop together. It was August and a church I was a part of by the name of Imago Dei Community was holding their annual kickball tournament. I rode my bike there to help set up, locked it, and found my uncle Kevin. Kevin was a pastor at Imago and had recently convinced me to move to Portland from Colorado where I had grown up and lived my whole life. Kyle had a shaved head like my uncle. He wore glasses, shorts and a brown polo. He looked youngish, around thirty or so and had broad shoulders. I would find out later that he was the kind of guy who ran marathons for cancer patients. I was the kind of guy who ran to the Plaid Pantry for cigarettes. At that point, I would not have predicted that two years later the three of us and multiple others would be involved in a church plant from Imago to Salt Lake City. I wasn’t sure if Salt Lake had this. What I knew of Salt Lake was conservatives and Mormons. Also, snowboarding. Salt Lake is a huge snowboard capital. So I liked that. But everything else…well, it was questionable. All I knew of Salt Lake I knew from driving through it years ago on a road trip with my grandparents to California. I remember the Salt Flats stretching out like an ocean and the smell overpowering, like Yellowstone geysers. I remember how close the city felt to the mountains, as if the city came first, and the mountains had slowly crept up around it, like giants. I remember that the Olympics were about to be held there, so there were giant billboards and statues of Olympians in tight fitting spandex. Then all I saw was desert, desert, desert. This was what I knew of Salt Lake City. Like most good stories worth telling, there’s a back-story to how all of us winded up in Salt Lake. If one watched movies all day, one might get to thinking that every character suddenly arrived at exactly where it was that they were in the film and give little thought to the history, failures, suffering, families, marriages, and so forth that give things shape. The truth however, is that most of the exciting things that happen in movies are two hour glimpses of a characters whole life. Movies are compressions of time. So naturally, the bad parts are left out. Not even the bad parts necessarily, but the monotonous ones. So in writing this, I would like to write as much about those parts, as the exciting ones. Because the truth is, life is not exciting. Not all the time at least. There was a time I thought it was. I thought that every single moment was to be spent in some high-speed car chase or dangerous romance. When this did not happen I got disappointed. If I wasn’t leading a Scottish rebellion against England or subverting the Roman Empire as a gladiator I felt like I was failing somehow. But perhaps a lot of life is about finding contentment. Finding peace in the small things, the simple things. Maybe life isn’t epic at all, and maybe that’s okay. So this is a story about the small things, and how small things can be great things. This is about mustard seeds and yeast. This particular story, of a group of people living life together, gathering occasionally to sing songs, learn about the nature of God, and love a city (also known as a church) starts with the story of an individual, Kyle. Not because he’s the leader necessarily, but because he’s the most handsome, and well, just a good place to start. Kyle grew up Mormon in a small town called Eely in Eastern Nevada. His family was fifth generation Mormon. So, kind of a big deal. Kyle was 18 and about to go on his two-year mission when he started questioning his faith. And in that faith, questions are a bit, um, well…not quite allowed. It wasn’t even that his questions were out of place. Kyle was studying the faith and preparing an apologetic defense and explanation to those he would encounter, so he came up with a list of questions he figured most people would be likely to ask. He was able to answer all the questions except one or two. So he went to his dad. He handed his dad the piece of paper and his dad stared at it, slowly, and then looked up. His dad looked at him and said, “Why are you asking these questions?” Kyle explained. “You don’t ask these questions son,” his dad, all of a sudden looking very stern-like, said. “Your questioning me,” his grandpa shook his head. “You questioning your father, your great grandfather, your elders, the prophets…” etc. etc., etc. So Kyle left that day for the first time wondering what it was, he really believed. Six months later he had his name resigned from the Church of Jesus Christ of Latter Day Saints. Six months later he didn’t even know if he believed in God. Kyle enrolled in the University of Las Vegas. He never went on his mission. While at the UNLV he met Joy, his current wife, only wife at that actually. Joy was a Christian. With a name like that, go figure. Kyle and her started dating and so the conversation once again opened up towards faith, God, religion, so forth. It was a very messy time for both of them. Kyle didn’t want anything to do with religion and Joy, naturally, didn’t want to date someone like that, and neither of them wanted to force the other. They would break up. They would get back together. Then they would break up. One day Joy dragged Kyle to church. It was a big church, what someone like me might call “hokey,” but all things considered, a good church. As Kyle sat there he didn’t feel or think much at all about it, you might say he was “Puttin time in with the girlfriend,” but as the pastor started speaking, something happened. The sermon was, by all accounts, typical, but what the pastor kept doing, and without perhaps anyone else but Kyle realizing it, was use himself as an example. As he preached, he would talk about the darkness in his own heart, how he was trying to overcome it, and how the Gospel was transforming him. To Kyle, this was astounding. In the Church of Jesus Christ of Latter Day Saints, this would never happen. As much as you put your faith in God, you put even more so in man, so for a man to get up there and simply explain that he, too, was afflicted with the human condition, was literally mind blowing. This jacked with Kyle. For a long time. So began a discovery back into the heart of God, but separate from religion. Kyle became a Christian, married Joy, and a few years later was on his way to seminary. From here he worked at Central Christian Church in Las Vegas for a few years before he felt God telling him to move to Portland. So Kyle moved. With Joy of course, and they didn’t really know what to do, but felt okay. They knew about Imago Dei and Kyle had met Rick McKinley (the pastor of Imago) at a conference a while ago, so they started to plug in there. Before long, Kyle got hired on as the youth pastor and everything in the world was good. However, not two months after they moved to Portland, their dog died. And then, two weeks later, Joy’s dad committed suicide. But it was during this time, they learned what the word, “community” meant. And I mean, really understood not in a “I went to bible college so let me tell you about the Greek indicative plural past tense,” but in the way that you feel the woman you love deep in your bones. The Costello’s were flying back to Las Vegas for the funeral when they were greeted by a mob of people that could honestly only be described as HEAVEN when they got off the airplane. The community of friends from Central absolutely swarmed them, Joy swept up as in a cloud of women loci, and for the entire week hovered in a swarm of love, compassion and community, not even allowed to descend to the dirt of the earth until she got back on the plane to return to Portland. Yet, as soon as they go off the plane from Portland, they were swarmed again. They were film stars on the red carpet compassion of the Imago Dei paparazzi. They had expected it from Central. But this? They had barely been here a summer. So if you ask them, they will say this was the summer they learned about community. So the Costello’s did what they could to move on. They were loved. They were in community. This helped a lot. It was nearly two years later when Kyle was asked to speak at a church planting conference held in Salt Lake City. A bunch of people wanted to take back the city from the Mormons and figured a church was the best way to do it. Salt Lake was a battleground. They invited Kyle to speak because they knew his background and figured he could give some valuable insight to how the next crusade of the Christian church was to be won. As Kyle listened to speaker after speaker go on and on using terms like battle, fight, win, take-back and so on, his heart broke, and he also got a little angry. When it was Kyle’s turn to speak, he did so. Mostly, he just spoke his mind and said that “taking back” the city from the Mormons was not the Gospel, it involved very little love and humility and was based on religious pride and Christian rhetoric rather than a desire to see transformation in the Mormon community. When he was done, a lot of crickets started chirping. And as Kyle left the conference he thought very little of it. “I said what I had to say,” he thought. But there was one guy, all the way in the back, watching. I picture him like Aragorn the Ranger, smoking his pipe in the dark back corner of the stadium, watching Mr. Costello, listening. Taking puffs and blowing O rings, a hood on his face. A few weeks later, this dark ranger approached him, his name was Paul, and he was part of the Orchard group. A church-planting group. “We want you to start a church in Salt Lake City.” Paul said. The Orchard guy said, “Well, we’ll be in touch.” And I like to think that this exchange happened in a parking lot and the guy flicked his business card at Kyle while saying, “We’ll be in touch,” very ominously, as if both of them knew that they had no choice. Kyle, you-are-the-chosen-one-sort of-thing. And then he lights a cigarette and peels away in a dark sedan, leaving Kyle in a dark parking lot, alone, standing with a briefcase beneath a dim lamppost and a confused look. For a year the Orchard guy kept calling. Kyle kept saying no. Kyle eventually said yes. His wife said yes. His background/family/religious history said yes. God was probably okay with it. And eventually Kyle himself began to like the idea. It’s just too bad it had to be Salt Lake City. Once a month on Fridays we have men’s group at 6:00 in the morning. We get around and talk about trucks, weight lifting, and our wild hearts. We watch UFC, use war analogies—you know all the usuals. Really what we do is meet together, have breakfast and coffee, and discuss the misused diction of Christian linguistics. What does it actually mean to be saved? What does the word “calling” really mean? Can we question the calling of others when they say, “God called me here,” and we think that perhaps this is just a nice Christian excuse to do what you want to do? Today we talked about being born-again and what that means. I asked whether or not it is natural to want to punch someone in the face when they use this word on CNN. No one acknowledged me. After breakfast and our chat I go outside to smoke a cigarette. I am preparing to head up to the U to fight my arch nemesis—math—over a two-hour test. Tomorrow I am leaving for Bend, Oregon with my girlfriend to visit her sister, and so I had to take a math test, roast about 15 lbs. of coffee, pack, and see if the pair of shoes I ordered had finally come in. I’d been a nervous wreck the whole week, not sure if I should go through with the purchase of said shoes, when would be the right time to commit my life to such a heavy, and unchangeable path of wearing these shoes. I looked at the Wasatch Mountains behind the office. They were hazy, blue and shafts of light began to peak through the canyons. I took another drag from my cigarette and felt the dull, indistinguishable rumble of an upset stomach. I thought about how much I drank last night. Not that much. I took a deep breath and tried to pull myself together. Kyle and Jeremy were talking across the street and I didn’t want them to see me if I started, when, suddenly becoming a more appropriate word. I couldn’t take it. This morning’s breakfast of pancakes and sausage and coffee and orange juice all came out swiftly and relatively quietly. I made it to behind the dumpster in just enough time that no one saw. I stood up for a second and knew there was still more to come. I leaned over again, but this time it felt different, more fluid, less chunky. And as my esophagus wrenched I saw the bright, rich liquid of what I knew to be blood come spraying out on top of my recent pile of vomit. I threw up some more. It was rich, burgundy, nearly sparkling, a purple wine color. It had to have been more than a cup. I placed my hand against the white brick wall and knew that my day was about to get much, much, harder. I didn’t know what throwing up blood meant. Did I somehow get alcohol poisoning? Or an ulcer? Alcohol poisoning was not a rational thought, since I had only had four drinks last night, but still, I wondered. I went back inside and my friend and La Barba Coffee Roasting business partner Tim Walzer was still there. “You have blood on your beard,” he said. Two days ago I finally decided to buy myself a pair of shoes. Why not? Does the why not make it sound less romantic? Probably. But realistically, I don’t have my hopes up for anything much in the purchase of shoes. I am operating out of three basic assumptions about the buying of shoes 1) These shoes will not make me happier. 2) These shoes will never fulfill me in the way I want them to. 3) These shoes will expose my own hypocrisy, selfishness, and ultimately be about my own sanctification and the glory of God. Therefore, though I love these shoes, though I am choosing to be with these shoes forever, though I know it will be hard, that the buying of these shoes makes the most sense, and that I will buy them without unrealistic expectations of what they can do, it just makes sense. Also, the temptation of wanting to wear the shoes without buying them is a little too much for me, so I’m thinking for my own purity (and the shoes) it will be better for the both of us if I buy them soon and then we can both go home and get inside each other whenever we want. I can’t say it’s been an un-stressful, blissful experience, this choice of settling down with this pair of shoes. “Yeah, I just threw up,” I said to Tim. I think about this question, this question of whether or not I have been stressed. I am in the last semester of what’s turning out to be my hardest semester of college, I am starting a business, which has the potential to fail at any moment, I am constantly trying harder to pull myself up by my bootstraps to be a better Christian, and yes, I have just bought a pair of shoes two days ago, and am still unsure of whether I am making the right decision, or perhaps sure, but scared, and nervous for what I am getting myself into. The Raw Honesty of Louis C.K. When I was growing up, I once heard my pastor that God didn’t have a sense of humor. Humor, he said, was based on imperfections, and therefore nothing of God could coincide with anything less than perfection. Whatever the theological reality of this statement may be, humor is indeed based on the imperfection of life. 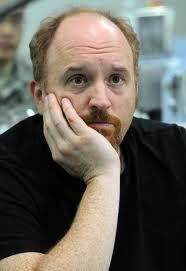 And there is no man who knows imperfection better than Louis C.K. The Boston born actor, director, and writer, has been hailed as the best stand-up comedian of today. He gets his title not from magazines or media outlets, but from fellow stand-up comics. His show Louie on FX has been critically appraised and he’s written and acted in movies with the likes of Ricky Gervais and Chris Rock. What Louis C.K. does best is unearth the façade of decency we live under and delve into the darkest workings of the soul. His act is crude, depressing, and self-deprecating, but it is also touching, raw, and incredibly honest. C.K. will get on stage and talk about anything from masturbation, to his recent divorce, from his own self worth, to raising his two daughters. The common claim about C.K. is that he says what we’re all thinking, but are too afraid to say. The reason I can’t but help love Louis C.K., even though it may not be the “cleanest” act in the bunch, is that on the one hand, C.K. can get up and do a show about how incredibly depraved he is, and in the next breath enable you to laugh at the jacked up world in which we live. In many ways he is merely a mid-forties struggling parent who loves their kids very much. This contrast, between crude comedian and a generous, aware soul, gives Louie’s comedy something other comedians don’t have, personal exploration. It’s easy to take pot shots at religion or politics as many comedians do, but it’s much harder to be almost unbearably honest with yourself. Yet, Louie never strays too far into the cruel. Most comedians would rail against their ex-wife, but he has yet to do so, claiming in one interview that it’s her privacy and he doesn’t feel right exploiting that. In many ways, this has been a fundamental problem in the Christian church. Many of us refuse to acknowledge our ugliness and this leads to nothing more than hypocrisy and moral failures. Honesty is a hard currency to come by within Christianity.